Political changes and the desperate struggle for power between different factions of the occult structures had as effect the rebellion of some of the figures and media entities within the system which, in order to defend their own interests, began to bring to light a large part of the dirt within the justice system in Romania. For those who have followed the judicial and mediatic persecution against the mentor of the MISA Yoga School within the past 13 years, these disclosures are not a novelty, but only a new confirmation. The disclosures made by insiders such as Daniel Dragomir and Ingrid Mocanu, whom you can see in this video montage, detail the method employed by the secret services for the destruction of undesirable people, method which was also rigorously applied against yoga teacher Gregorian Bivolaru. The abuses are obvious now, even if only by comparing the topics in the press of today, versus 13 years ago. 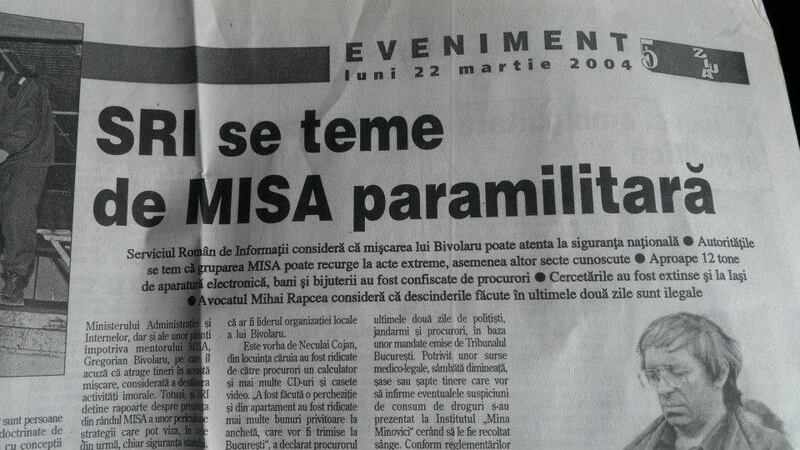 If today the involvement of secret services in justice and in the media is presented, obviously, as a huge abuse, a breach of the Constitution and a return to the practices of Ceausescu’s „Securitate”, in March 2004 the coordination of the massive attack against MISA, the largest police operation after 1990, was publicly assumed by the Romanian Intelligence Service (SRI), and their servants in the press picked up the distorted version of a so-called „great national danger” represented by an organisation which promotes yogic and meditative practices, non-violence, vegetarianism and voluntary abstention from the use of any toxic substances (including tobacco, coffee, etc). The recent avalanche of disclosures on this subject make us believe that the day when we will find out the whole truth is coming. Unfortunately, the yoga teacher Gregorian Bivolaru has already executed the unjust sentence.